Designed by Édouard Muller (called Rosenmuller), French, 1823 - 1876. Made by the firm of Jules Desfossé, Paris, c. 1851 - ?. 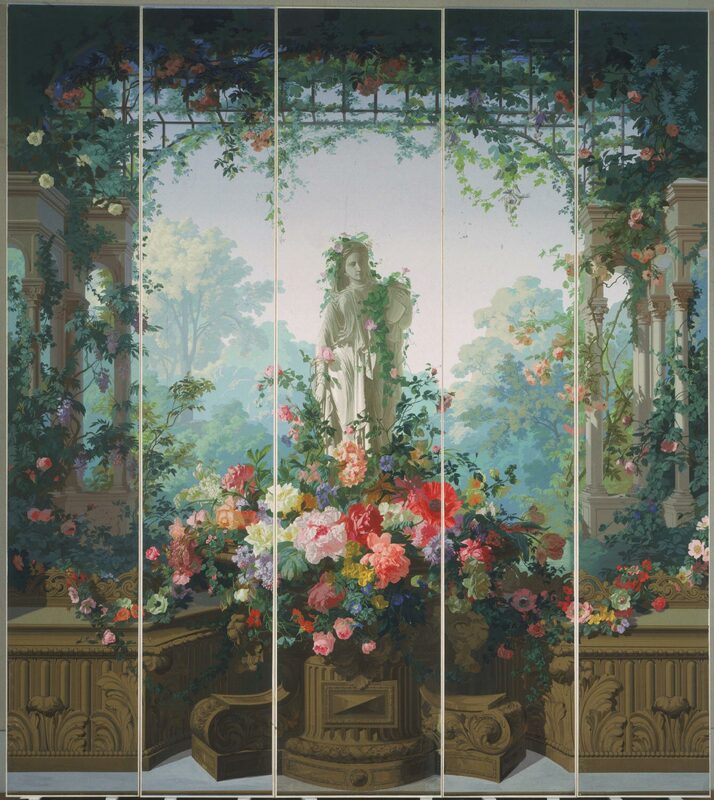 This panoramic wallpaper was the centerpiece of Jules Defossé's exhibit at the Paris Exposition Universelle of 1855, where his display was awarded a first-class medal. An ensemble of three tableaux, of which this was the central panel, the wallpaper depicts the magical garden of the enchantress Armida, described by the Renaissance poet Torquato Tasso in his masterwork, Jerusalem Delivered (1575). This learned reference was interpreted for the wallpaper with great originality by the flower painter Edouard Muller, whose lush and botanically accurate vegetation overruns the imaginary garden architecture. At the center of the scene is an ornamental statue, which Muller copied with similar exactitude from a sculpture of Pandora by James Pradier. Seeking both inspiration and instruction in these literary and visual sources, Desfossé was determined to raise the industrial production of wallpaper to the level of fine art, employing in his factory such recognized artists as Muller to spread the art of decoration to even "the most modest interiors," as a critic noted in 1855. Katherine B. Hiesinger, from Philadelphia Museum of Art: Handbook of the Collections (1995), p. 152.